Ahoy, mateys! So ye be wantin' t'learn how t'spell right proper, 'ey? Well, you're in luck! Captain Roundhoof's pirate school is acceptin' students, and I'm here to tell you how to pass with flying colours! 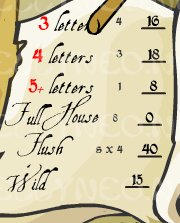 Word Poker is played in six rounds. Each round, you're given 8 letters (the letters are different each round), from which you have to make as many words as you can in the allotted time (60 seconds per round). Words must be at least 3 letters each, and can only use the letters you're given. Additionally, you can only use the letter the number of times it appears - if your letter set only includes one "E", for example, you cannot try to make a word that uses more than one "E". The letters may , however, be used in as many words as you like during that round. To submit a word, simply type it in and press "enter" (you can either use the button on your keyboard or the one in-game, but keyboard is generally faster). The word will then clear, and, if it's an acceptable word not yet used in the round, be added to the list on the bottom right. The game will only accept words that appear in the Neopian Dictionary (no proper nouns allowed! ), so no making up words! If you do get some wrong, though, don't worry - the only penalty is the time you spent trying the word! In the above example, you could enter words like Rank, Ranks, Run, Runs, Nor, etc. You could not use Ron , because that is a name - not a word. You could also not use Soon , because that requires two "O"s, and you only have one. At the end of each round, you'll be asked to choose one of the following categories to take the points for. Each category can only be used once per game, so pick carefully! The images below show the options once you've completed a round - the one on the left is from the first round, where you can choose any of the sections. The one on the right is from a later round - the squared sections have already been used this game, and cannot be selected again (even if you would have a better score). 3 Letters - This section's score is dependent on the number of valid three-letter words you've submitted. Each word is worth 4 points, so the score is the number of words times four. 4 Letters - This section works the same as the 3-letter one, but each word is worth six points. Getting at least 10 words here will add 30 points to your score in this section. 5+ Letters - Yup, you know it - every valid word you enter with five or more letters is worth 8 points. Getting 10 or more words here will add 100 points to the score in this section. Full House - If you have fifteen or more words total, you'll be eligible for the "Full House", which is worth 50 points. If you manage to get twenty-five words or more, this will be bumped up to 150. 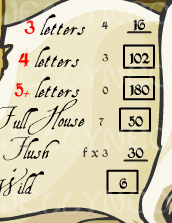 Flush - During the round, there will end up being one letter that begins more words than the others - the number of words you enter that start with that letter are multiplied by ten for the final score. If the number of words begun by two letters are equal, it will randomly list one of them. Wild - This section counts points for each word you enter; longer words are worth more points. Three-letter words are worth 1 point, four-letter words are worth two, etc. If you have an "S" available, make sure you get as many plurals as you can! The game will count them all as different words. Fun as some of those more questionable words may be, the game's dictionary won't include everything you might've found in a standard dictionary. Nice try, though! If you're on a later round, and only have certain categories open (such as 5-letter+), don't waste time trying to put together a ton of three-letter words - they won't do anything for you in the long run. Sometimes you'll simply run out of possible words long before the round ends - in this case, you can select the points you want to take at any time, and the round will end immediately. Every valid 7 or 8 letter word you submit automatically earns you 50 points - no selection required! Neopian words count, Neopian NAMES do not.